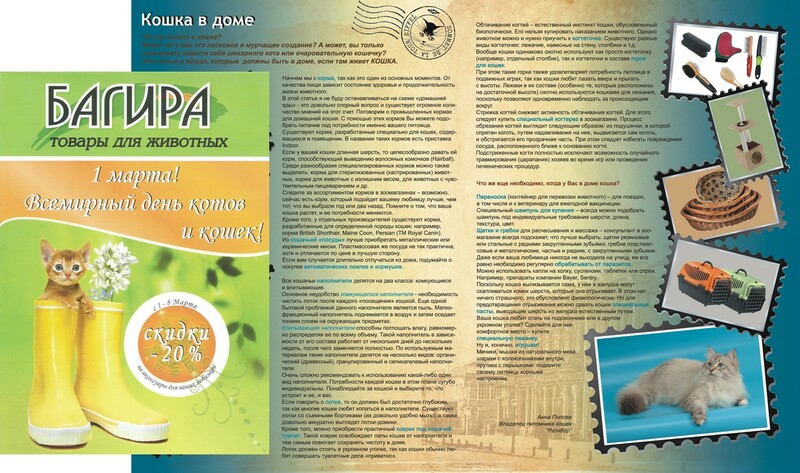 Special issue of Russian professional journal "Cat.info" was published in September 2013. The theme of the issue is Siberian breed. 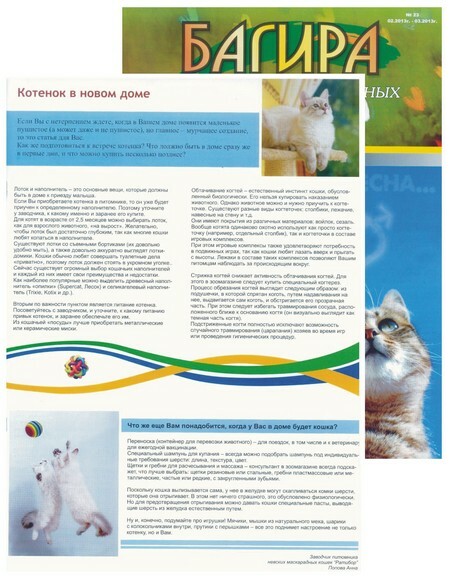 Short interviews of Siberian breeders and felinologists are given. The only representative of Ukraine is the cattery "Ratibor". The photos of our cats and the opinion of the owner of the cattery are published. 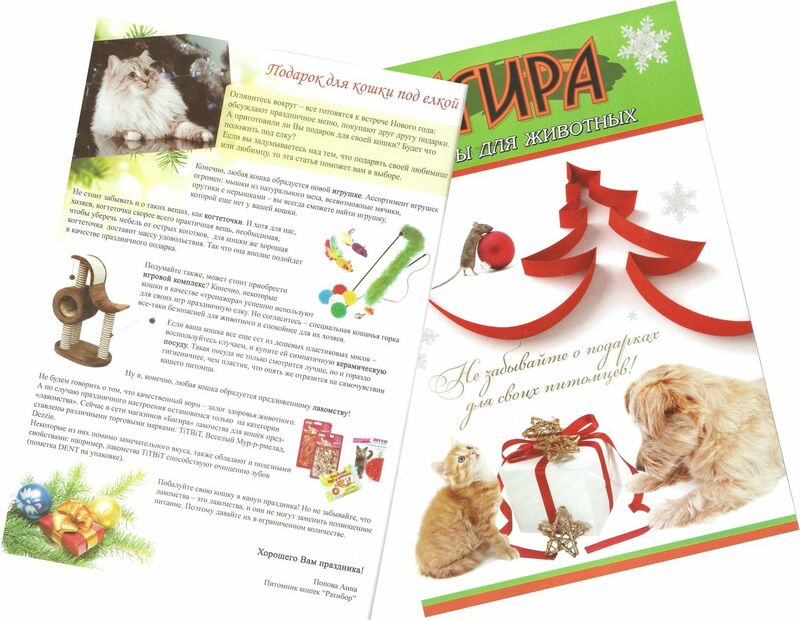 An article about gifts that we can present to cats for New Year has been published in monthly magazine "Bagira". 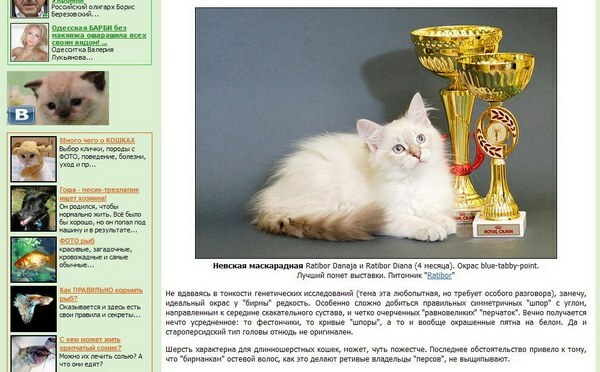 The article and the photos are provided by the cattery "Ratibor". TV program "Club Chico" at the first Crimean channel. During the report from the international exhibition our cattery was shooted. The interview with the owner of the cattery (beginning at 3:22) The cat Christian helps to answer. Ratibor Diana (title the Best Litter) and our cat Serafima (title Grand International Champion) are presented in the article "The Neva Masquerade Cat" on the website zooclub.ru. International Cat Show on the RUI system in Simferopol. Examination is carried out by the expert of the category of all breeds Gnatkevich Elena. The cat from our cattery Feya (title International Champion) is in the ring. An article about getting ready for appearing of a kitten in the house: food, toilet, accessories, toys etc. has been published in monthly magazine "Bagira". The owner of the cattery shares the information, our graduates are presented on the photos. International Cat Show on RUI system, 25-26th May, 2013.Examination is carried out by expert of the category of all breeds Anna Bondarenko. The cat from our cattery Ratibor Iliana (title International Champion) is in the ring. An article about necessary items in the house in which lives a cat has been published in the monthly magazine "Bagira". The author of the article is the owner of the cattery "Ratibor", our graduates are presented on the photos.